Nestled in the Santa Catalina mountains of Southern Arizona. Tucson offers enough diversions and the appeal of the Southwest lifestyle to tempt any vacationer or business group. The Adobe Rose Inn, built in 1933, exemplifies that Tucson lifestyle. 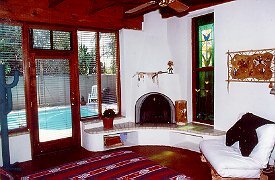 Located in a quiet, university neighborhood, this unique B&B is constructed of thick adobe walls, the furnishings are of native lodgepole pine, and the floors are the original oak. The Inn offers four charming rooms, one casita (or cottage), and one suite, ideally suited for longer stays. All rooms have cable TV and private baths. Some have fireplaces and stained-glass windows. The property is gated and surrounded by five foot adobe walls, which not only provide privacy, but enhance the quiet of this prestigious neighborhood. After a long day of hiking, enjoy the bougainvillea-draped pool area and then take a plunge in the hot-tub. Casual southwest comfort.... The Adobe Rose Inn.